Hooray for human misery that lets me push my barrow! AN unrepentant and defiant Adam Bandt has stood behind the ill-timed bushfire comments he made on social media at the peak of yesterday's NSW firestorm. The Greens MP infuriated many when he tweeted that "Tony Abbott's plan means more bushfires for Australia & more pics like this of Sydney". That comment came at the very moment that every TV network in Australia showed graphic images of people's houses burning. "Well, in the last 12 months we've had the hottest year on record, the hottest month and the hottest day. Tony Abbott has picked this time to say he's going to rip up action on global warming, which is going to to mean these are the kind of fires we will see more often." The words 'crass' and 'insensitive' and 'Richard Cranium' come to mind. I'm not a big fan of the Greens, but I see nothing wrong with pointing out the elephant in the room. It's no different to oppositions highlighting "horror stretches" of highway straight after a multiple fatality. DEATHS from Sydney’s extreme heat are expected to triple by the end of the century as the city cops the brunt of global warming, a leaked climate change draft report warns. The threat of bushfires will increase, another 800,000 people will fall ill each year from contaminated food and water and more than 270,000 homes will be at risk of collapsing into the ocean from rising sea levels. The unreleased draft of the Intergovernmental Panel on Climate Change’s second report also warns that $226 billion worth of coastal assets are at risk with just a 1.1m rise in sea levels. But, curiously, there was no adverse reaction on Twitter or from federal MP’s to this unauthorized ‘leaked’ story or the fact that the tragedy of the mass destruction that had just happened in Port Stephens was being so directly linked to climate change. The fact of there being no reaction suggests that what has hit a nerve with Bandt’s 70 character tweet was that it was critical of the Abbott government’s policies on climate change, rather than the link between climate change and the out-of-season nature of the fires. In which case, we might need to think again about who is politicizing what in the midst of this ongoing inferno. It is very different because the persons highlighting the horror stretches of road did not influence the maintenance of the road, whereas the Greens have long opposed fuel reduction in bushland. Bandt is emulating Bob Brown who jumped on the flood bandwagon and famously accused the coal miners of being responsible for the devastating floods in Queensland. The greatest fire problem is gum trees and the Greens get frenzied at the thought of clearing them away from houses and the sides of roads. Is this a subtle shift of the goalposts I see before me? Your original beef was with the inconsiderate timing of Bandt's comment, no? While recognising that controlled burning is only one form of bush fire risk reduction, The Greens have not been responsible for restricting its use. We are committed to an effective and scientifically based approach to hazard reduction, which takes into account the needs of both the human and natural environments. I take it you're not advocating a non effective and unscientifically based approach to hazard reduction? Not shifting the goal posts at all. Your complainers about the road were not on the maintenance staff whereas Bandt, being an elected Green member of parliament was; he takes no responsibility for not warning all these people that lost their homes but tries to shift the blame onto Abbott; Abbott was not in power while the fuel load was growing. Which is what they changed it to after the disastrous fires in Victoria, they have rather a habit of changing their policies to suit the moment. Not at all just a non-Green approach. Fact is, the climate is changing. No surprise that the anti-green advertorial came from News, is it? The tone of it is almost rabid. In recent times News have appointed themselves the LNP's attack hounds. Be that as it may, have a look at Bandt's Twitter where folk are having a piece of him. His remarks are what matters but more particularly their timing, utterly insensitive no matter how he tries to now crawl out of it. Perhaps. No more so than the drivel that runs out of Coalition or ALP mouths at times. Peter Fitzsimons pretty much sums up how I feel. Can we give the Greens a break? For yonks they've been saying if we don't look after the planet there will be hell to pay, and so, when that hell on earth arrives - most lately in terms of these unseasonal devastating bushfires - it is quite legitimate for the likes of Adam Bandt to draw attention to it, and advocate a change in policy. In the words of Barack Obama, denying the reality of climate change is the equivalent of belonging to the Flat Earth Society. The carbon tax was demonstrably successful in reducing emissions. 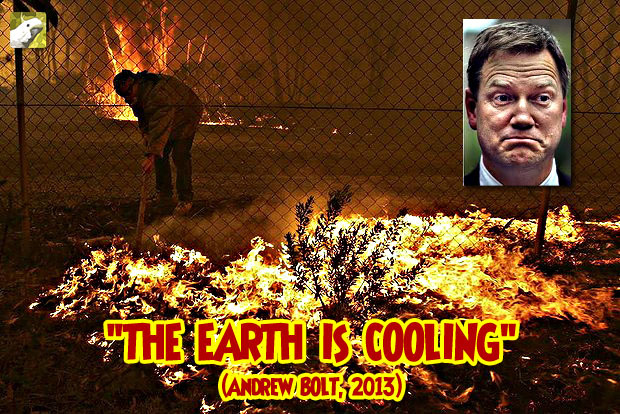 So when the Prime Minister says the previous government should ''repent'' bringing it in, even as we break yet another month's temperature record, and the bushfires take hold, it is reasonable for Bandt to put an alternative view. He is not disrespecting those who have lost their homes, nor those heroes fighting the fires. He's saying what needs to be said, to try to do something so fewer people lose their homes in the future. The problem is not that he's pushing his ''political agenda''. It is that his agenda - actually doing something to preserve the planet - is not shared by us all. The carbon tax was demonstrably successful in reducing emissions. What change did the "demonstrable success" of the carbon tax (that supposedly wasn't a tax) make to Australia's temperature, and how much of a factor was such a change in causing the "unseasonal devastating bushfires"? What Bandt ought to be doing is urging the Government to cut down and remove as many trees as possible from around homes before the fire arrives. All that is needed are chain saws and towing vehicles and the will to be non-PC and do something constructive. Even felling trees and leaving them on the ground is helpful as there can be no crown fire. The number of water carrying planes is woefully inadequate, what did Bandt and the Greens do towards getting more water carriers? Anyone would think that we haven't had fires in October before, or even September and August. The topic of the thread was about Bandt's perceived insensitivity, as was the thrust of Fitzsimon's piece. I've come to expect diversionary tactics from you (bit disappointed in Rod, though) when your argument is weak. But to pick out a couple of phrases and use them out of context to try to discredit the theme is a bit rich even for you, but anyway..
What we are seeing is the result of man made emissions to date. What we are going to see is an increase in frequency of these events if we take no action on global warming. I know that, Bandt knows that, every credible authority on the planet knows that, and I suspect you do too. Agreed. But there are already enough voices hammering that aspect now. Governments, Local Councils, Fire Authorities for example. Bandt was highlighting the certainty of increased events in the future. The problem as I see it would be manpower. Home owners can and should take action on their own property but are not allowed to go clearing state land. A common cause of house fire is embers (maybe the most common?) When you have a fire 100m away with an 80k wind up it's arse, there's precious little you can do but wet your house down and pray, whether you've been busy with a chainsaw or not. Just on the water bombers, Bandt is a minority politician in the Federal Government. Don't you think the question should be directed to O'Farrell? Oh, I forgot. His forte is reducing funding for firefighters. Oppositions aren't members of parliament? The original of this photo appeared on Abbott's facebook page. Briefly. No doubt Cruella de Vil ordered it's removal. Obviously if Abbott posted that photo at the same time as Bandt posted his insensitive comments then Abbott is just as guilty as Bandt. Was it posted whilst the fires were burning or before?